The latest introduction from GlobePharma is the SIFT-N-BLEND® new powder blender with a built-in screening mechanism. The screen is mounted on the blender shell trunnion and it rotates along with the shell in the same direction, while a paddle turns in the opposite direction of the screen. A variable frequency drive controls the speed of the paddle. The screen picks up the powder and the paddle pushes it through the screen. 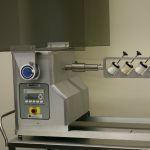 The Sift-N-Blend™ can be used on blenders ranging from 4qt to 150 cu ft. GlobePharma can retrofit any blender that has an intensifier bar provision. Eliminates the need to pre-screen any materials. More uniform and physically stable blends can be obtained.